At the WWDC keynote Monday, Apple announced its first-ever deal with a U.S. cable provider to make Apple TV function as a cable box replacement. But, whether that can happen universally is another matter. The Apple TV portion of the keynote, also included the arrival of Dolby Atmos surround sound support on Apple TV's new tvOS 12 update, and new home control system deals. But it was another announcement that may end up making an even bigger difference to the future of Apple TV. Jennifer Folse, Apple TV's lead designer, said during the keynote that Apple TV is "the best box to connect to your TV —and that's now more true than ever, as more and more cable companies fundamentally shift how video gets to your TV." "This typical cable box is becoming a thing of the past, as these companies embrace Internet-based delivery," said Folse. "Many of them share our vision as the one device for live, on-demand and cloud DVR content. We've already started working with partners around the world to make this a reality." Apple had already announced deals with cable companies in Europe, such as Canal+ in France and Salt in Switzerland, where customers can access their cable through Apple TV rather than a traditional cable box. 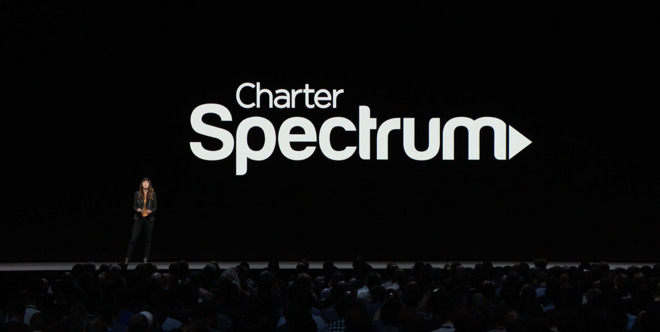 But the big announcement Monday was for the first such deal in the U.S.: Charter Spectrum customers will be able to get their cable through Apple TV, starting "late this year." Charter Spectrum, the product of multiple cable company mergers, is available in several large markets, New York City included. "That means that up to 50 million homes will be able to choose Apple TVs to access all their live channels and thousands of on-demand programs," Folse added. "They'll be able to use Siri and TV app to get access to their TV service not only on Apple TV but on iPhone and iPad as well." What will make that possible is the advent of Zero Sign On, a new feature that automatically detects the user's broadband connection and therefore does not require sign-on to any apps. It replaces the earlier "Single Sign On," which required users to sign on only once. Charter Spectrum, according to statistics released in March by Statista, is the third-largest pay TV provider in the U.S., with 16.42 million subscribers; they rank below Comcast and DirecTV and ahead of Dish Network, Verizon FiOS and AT&T U-Verse. Apple's $50 million figure would appear to apply to all of the cable companies worldwide with which it has reached partnerships. Apple will be "adding more providers over time," Folse added. The Charter Spectrum deal may have had its roots years earlier. Time Warner had said in 2012 that it would be willing to give up user interface control to an Apple TV box; Time Warner's cable division was sold to Spectrum in 2016. It's important to keep a few things in mind with this. Although the launch of a standalone TV service from Apple has been rumored over the years, that's not what this is. With these deals, Apple is partnering with cable companies, not seeking to replace them. Also, this doesn't have anything to do with "cord-cutting." This Apple TV deal is meant to benefit cable subscribers and, from the cable companies' standpoint, to get them to stick with cable, rather than abandon it. While Charter Spectrum is clearly a huge get for Apple, Comcast remains the leader in this space. Since Comcast has been strongly pushing their X1 platform and its own features, it doesn't appear they'd be willing to surrender their platform to Apple. Comcast, as of early last year, actually made its service available through Roku, although not through Apple TV. The cable box itself has a long and complicated history. Cable boxes have existed, of course, for as long as there's been cable. And for most of that time, they've been both not very functional and notably ugly. Even as cable has moved from analog to digital, the boxes themselves have remained big, grey and boxy, while taking up way more space than they should, while providing a substandard user experience. If you have a house full of gadgets, there's a good chance your cable box is the worst gadget you own. There's a reason for this: cable companies have long exercised near-complete control over distribution of cable boxes. They're like the rotary phones of old —customers don't get to choose which cable box they want, nor is there any variety of cable boxes on the market from different manufacturers. Consumers are stuck with what their cable companies give them, and also with monthly fees for the boxes. Cable industry revenue from the boxes was estimated at $20 billion per year as of 2015, though an analyst report the following year stated that if the industry ever lost that revenue, it would make it up by raising prices. The consumer electronics industry spent many years fighting for changes in that regard, arguing that innovation would lead to better cable boxes and higher customer satisfaction, along with, of course, more money in the pockets of electronics manufacturers. There were efforts to change this for years; as early as 1996, Congress asked the FCC to end the cable companies' monopoly on cable boxes, which led to the mostly failed "CableCard" system, but didn't meaningfully change the status quo. In 2016, the Obama Administration listened, and pushed the FCC to allow competition in the space. In a weekly address on April 16 of that year, President Obama specifically addressed the issue. "One industry that's ripe for change is cable TV. Right now, 99 percent of cable and satellite TV customers rent set-top boxes from their providers," Obama said. "According to one survey, this costs households an average of more than $230 per year. We spend some $20 billion to rent these devices. While we have almost unlimited choice in what we watch on television, from traditional programming to online content, there's next to no competition to build a better, user-friendly product that allows you to easily access all this content in one place." However, the rule was never finalized, and the change in administrations doomed Obama's proposal. When Trump-appointed Ajit Pai took over as FCC chairman, he scuttled the proposal. The proposal had been opposed by cable and satellite companies because it cuts off a big revenue generator with little outlay. The entertainment industry claims that piracy of media will increase if the cable box market is opened up. So, is Apple's deal with Spectrum a harbinger for the future? It may be, although such a future likely won't come without some legislative changes. More likely, it will involve cable companies outsourcing their cable boxes to specific manufacturers who are capable of making better boxes. The big test, though, will be how many other cable providers sign up. Between this, and the accelerating world of cord-cutting, there's no telling what home entertainment will look like in 10-15 years. But it does appear that Apple's battle for the living room has reached a new front.